How to Make Vegan, gluten-free and healthy Mushroom Biryani using instant pot. Mushrooms are filled with many nutrients, are a powerhouse of protein. It is an excellent protein source and can be a great meat substitute for meat for vegetarians. 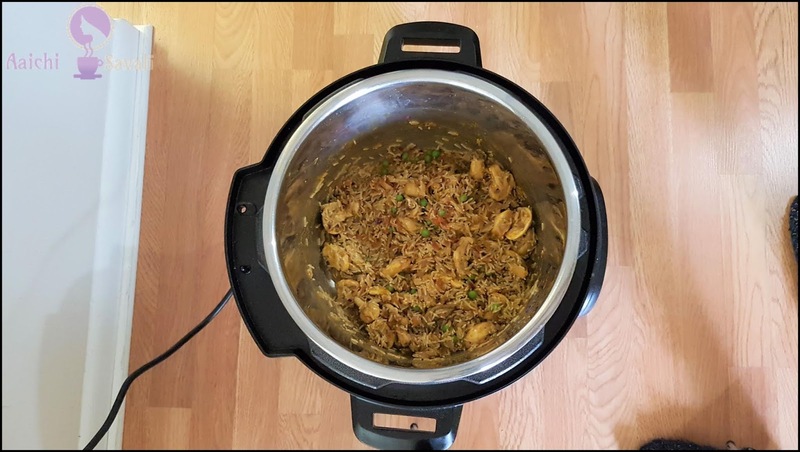 This healthy and straightforward mushroom biryani recipe, which can be made in few minutes using instant pot. Mushroom is favorite to many of us. I have shared other rice recipes using an instant pot such as sweet coconut rice, chicken dum biryani, and mint pulao, which has got so many good responses. 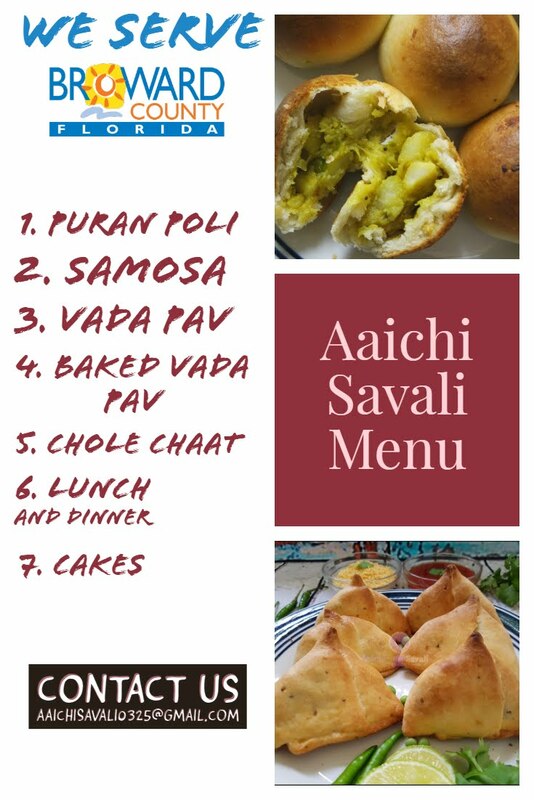 Most of you have tried it and also loved it. One of my followers asked me to share a mushroom biryani recipe, and here I am sharing this simple, vegan, and gluten-free mushroom biryani recipe. 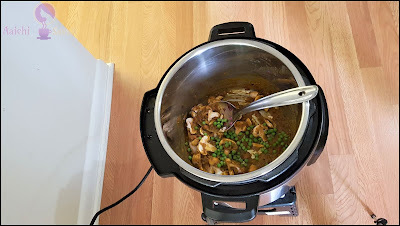 This recipe is prepared using instant pot and is a superb option on a busy morning. Finally, it can also be a great lunch box option for kids. Preparation Time: 10 Minutes; Cooking Time: 10 Minutes. Each Serving of Mushroom Biryani contains 272 Calories. 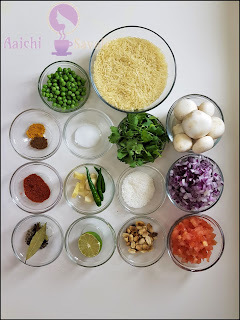 In a grinder/blender add coriander leaves, peanuts, coconut, garlic, ginger, green chilies, and lemon juice. Then add water and grind to make a smooth paste. Soak the basmati rice in cold water for 30 minutes. 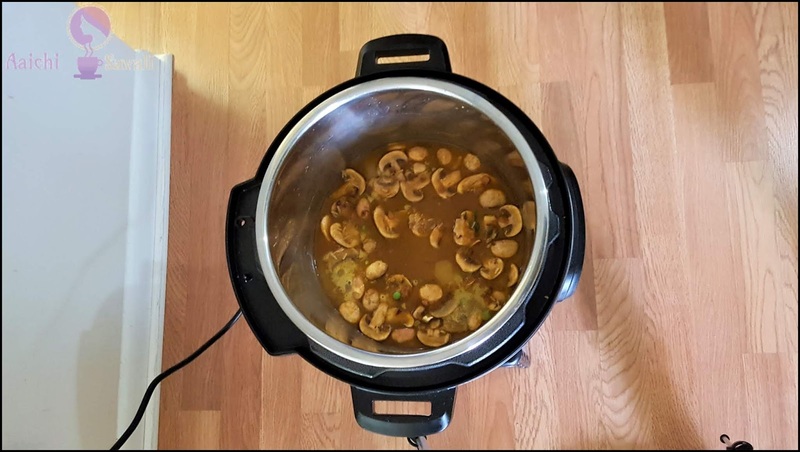 Turn on instant pot and press sauté function, add olive oil and once it gets hot, add the cumin seeds, shah jeera, bay leaf, cinnamon stick, cloves, cardamom pods, black peppercorn and let it splutter. Now to the pot add chopped onions stir-fry for 2 to 3 minutes or until the onions start to turn brown. Add chopped tomato and cook until the tomato begins to break down. Now add red chili powder, salt, turmeric powder, garam masala, and the coriander paste and mix them properly. Meanwhile, drain the rice and add to the pot. Now add and sautee mushrooms and green peas nicely. Finally, add 2 cups of water. Close the lid, place the vent on sealing position, and cook for 6 minutes at high pressure. Naturally release the pressure for 10 minutes then move the valve to release any remaining pressure. Immediately open the lid, mix the biryani, and serve it hot. Tadaa, a healthy bowl filled with protein and nutrients, Mushroom Biryani, is ready to be served with raita, green chutney, or curd. Brain: Mushrooms improve brain function, mushrooms are an excellent source of B vitamins, which help support adrenal function. Eating mushrooms several times per week is linked to healthy body weight, reduced waist circumference, and better overall health. 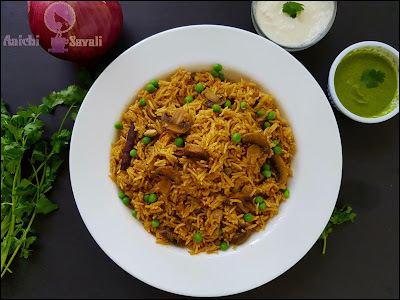 Eating Mushroom Biryani is good for lunch or brunch. Great tasting recipe. How much constitutes one serving? I cup or how many grams, ounces? Thanks a lot Saundrella. It makes 6 servings and each serving is 1 1/2 cup. Hope it will help you. 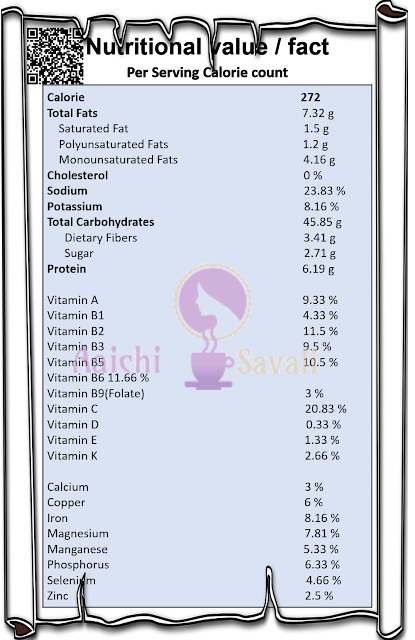 Forgot to mention, I really appreciate the detailed nutritional content. Thanks a ton, that means a lot to me.